Home / Uncategorized / Gillani is Down, I repeat Gillani is Down. Gillani is Down, I repeat Gillani is Down. Love the way SC done today this surly shows that “NAZRIA ZAROORAT” is burried. Now Gillani should say ” This is the beauty of Democracy”. a question mark on budget and energy conference held today, what about the foreign visits after 26 what about the usage of PM house..waiting to see how gillani goes back to home (Multan). I still remember ” CJ mera beta ka case hi sun la ” now he will chair the case. All wild cards by PPPP against SC went unused. 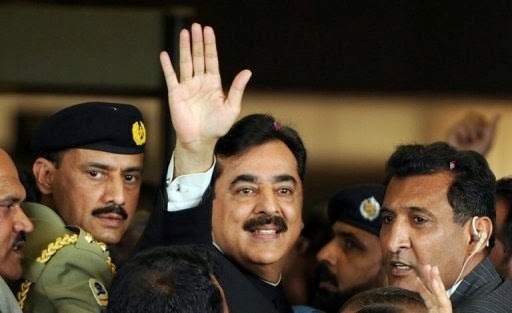 “Yousuf Raza Gilani is disqualified from membership of parliament from April 26, the date of his conviction. He has also ceased to be the prime minister of Pakistan,” said chief justice Iftikhar Muhammad Chaudhry, reading the order. Next: What a geography ! !